I love handbags but, when they aren’t necessary, they can be a real pain in the neck (literally) to carry. 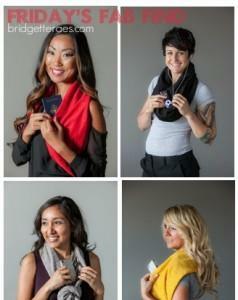 That’s why I’m featuring the Sholdit Scarf as today’s Fab Find. Being a fast paced woman, always on the go, creator Angela Lee, like most women, grew tired of carrying a traditional bag. Lugging a heavy purse, the strap cutting into the shoulder causing neck and back strain, having to dig around forever trying to find something, the constant worry of leaving it behind or fear of it hanging on a chair back for someone to swipe or dig in while not paying attention was the inspiration behind Sholdit. Additionally, every woman cringes at the thought of setting it on the floor only to get dirty, wet, or sticky and whatever else stuck to it. The idea for a new style of purse struck Angela after two particularly frustrating events: almost losing her passport in the airport and then actually losing her cell phone at a sporting event because she didn’t want to carry a bag all day. Her idea for Sholdit combined her love of the look and feel of a scarf, the security of across the body bags, and the simplicity of a clutch to incorporate everything to create an entirely new and different style of purse. Sholdit can be worn in a variety of ways and has the added value of converting back into a clutch when desired. The SHOLDIT Clutch Wrap purse prevents so many problems and frustrations including: making one limited to carrying only the necessities, giving hands free movement with out the strain, keeping valuables secure, plus it’s actually fashionable. So toss those fanny packs away forever, leave the purse at home and grab a Sholdit.